Apparently recorded in a series of spellings, although all quite rare, this is an English surname. 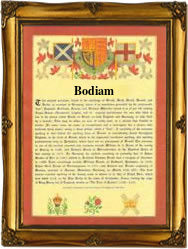 It is locational and originates from the little village of Bodiam in the county of East Sussex, or from the villages of Bodenham in Hereford and Wiltshire or Bodham in Norfolk. All have the same meaning of either Boda's farm, with Boda being an early personal name, or more likely 'Monks farm' from an Olde English pre 7th century word 'bod' meaning a monk and 'ham' a homestead. In the famous gazetter of England known as the Domesday Book of 1086 all four villages are recorded as Bodeham, and only in the 13th century did their spellings taken on different forms. Locational surnames are nearly always "from" names. That is to say surnames given to people after they left their original homes, the easiest means of identification being to call them by the name of their original home. Spelling being at best erratic and local dialects very thick, often lead to the development of "sounds like" spellings. In this case examples of the recordings over the centuries include: John Bodenham in the register of students at Oxford University in 1568, Barbara Boddam who married Fraunces Anwaryre at St Dionis Backchurch, on September 26th 1569, Roger Bodham a witness at St Olaves, Hart Street, on November 20th 1584, and later Mary Ann Bodiam, who married John Perrin at St Barnabas, Kennington, Surrey, on November 7th 1854, all these recordings being in the diocese of Greater London.